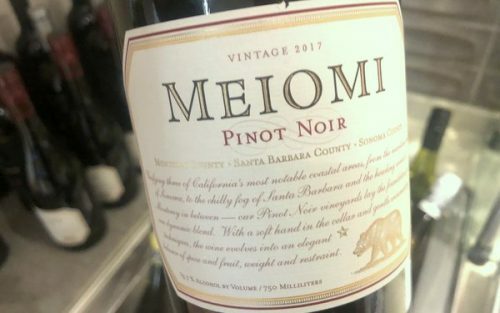 Meiomi Pinot Noir 2017: amazingly successful, but how good is it? I’m in the Star Alliance lounge at LAX, having just showered, getting ready for another 12 h in the air. I check out the lounge wines. On offer, Meiomi Pinot Noir. This is a very successful brand. It is huge in the USA, yet virtually invisible in the UK. The background is beautifully summarised here in a VinePair article by Emily Saladino. Read this and you can see why I’m interested to try this wine again with an open mind (my only previous experience was blind at the Judgment of BC, where 30 professionals unanimously ranked it last in a line up). It’s a hard wine to review. I’m aware that the consumer champions will be looking for any negative comments I make so they can dismiss me as a wine snob. And many of my professional colleagues will be looking for any positive comments, so they can beat me up for giving a big brand an easy ride (some pros do this: there’s marketing money in the big wine brands, after all). A few points, first. Success – both in terms of commercial success and popularity – are vital, of course, but it doesn’t mean that the product is of good quality in terms of professional aesthetic appraisal. Clearly, by the sensible definition of quality – fitness for purpose – this is a high quality wine, because it meets the expectations of its consumers, just as the Daily Mail (I won’t hyperlink this UK tabloid newspaper, it would hurt me) meets the expectations of its readers. If you are building a wine brand, then Meiomi is the ultimate success story. Many of us focus too much on the sensory properties of the product at the commercial end of the market. Second, this vintage, the 2017, gets a very high rating from Vivino users – 4.1. This tells you quite a bit about the usefulness of following Vivino ratings. Third, retailing at $20-25 in the USA, if this was imported into the UK, the shelf price would be about £20 and it would sell very few bottles indeed. The UK is a crowded market and there’s lots of more Pinot-like Pinot here in that price range. Fourth, by stating my view on this wine, I’m not criticising anyone’s taste. I’m merely saying that if you are interested in my professional opinion, here it is. It’s an opinion based on a lot of experience and comparative tasting, and a well trained palate. I’m not expecting everyone to agree. I don’t like this wine for reasons that I explain below. If, as a professional, you think this is a good wine (I’m not talking about a clever, commercially successful wine), then I disagree. If, as a consumer you think this is a good wine, then please keep enjoying it. If you decide you are interested in what the wine community of judgement thinks, then I’m happy to suggest that at this price, there are wines that I consider to be better quality and less tricked-up out there. So why does it sell so well? It’s accessible. Novice wine palates in the US clearly enjoy the flavour spectrum it presents, with the sweetness and the oak character. It is well packaged with a nice screwcap (Guala WAK I think: one that doesn’t show the ridges. Looks so much better). It is well distributed. It has a native American name that sounds exotic, but which is easy to pronounce. 4 comments to Meiomi Pinot Noir 2017: amazingly successful, but how good is it? …’the Daily Mail (I won’t hyperlink this UK tabloid newspaper, it would hurt me)…’, says the man who has a column in the Express. Very droll. You are spot on in defining this wine as one that fits a certain segment of the wine market. It’s a mass produced product. Industrial, not artisanal. Unfortunately we have too many such wines here in the US. There are a few big companies that dominate distribution and shelf space. More and more you have to be on mailing lists or buy directly from the winery to find interesting and memorable wines. He may have protested too much Richard, but I think you should cut him some slack. After all he had just stepped off an airplane and voluntarily undergone trial by Meiomi. I also tried it at an airport (San Francisco)about 5 years ago. At the time I had no idea what it was and only later discovered its popularity. I couldn’t believe how awful it was. The ghastly sweet spice made it almost undrinkable. Who is buying it and why?